Our range of products include wooden chinese potli buddha, wooden happy buddha statue and wooden laughing buddha. Clients can avail from us a wide array of Wooden Chinese Potli Buddha . This range is available in the market in various different styles and unique patterns. Besides, this range is highly demanded by the clients for its shine and finishing. Along with this our range stands high on all the quality parameters set by the concerned authorities. Moreover, professionals manufacture this range after following the stringent norms and standards, in conformation with the needs of the clients. 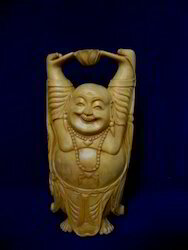 This Wooden Happy Buddha Statue is one of our wooden handicrafts items. This wooden happy men is made by white wood and sandal wood. This is available in various design and good finishing. This wooden happy men are used to office and home decorative items. Our range of wooden & sandal wood happy men are available most cheep and competitive prices. We are the leading manufacturer of all types sandal woods beads, mala and statue. 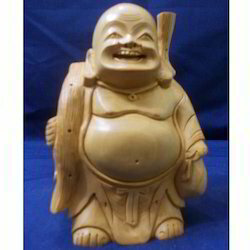 We serve you wooden laughing buddha statue in best quality in best price range. We will provide you in bulk quantity only. We are majorly exporting our products in USA, UK, China, Australia, HK and many more country.